On Spheres of Influence, his second offering for Sharp 9, Lynch addresses that situation with a panoramic program of music encompassing his broad range of interests. His earlier recordings (Peer Pressure, Back Room Blues, At The Main Event on Criss-Cross; In Process on Ken; Keep Your Circle Small on Sharp 9) plus sideman dates with Art Blakey and Phil Woods document a fiery coherent improviser with a personal take on the Post-Bop trumpet tree (genus Blakus-Silverus) that leads inexorably form Clifford Brown to Lee Morgan to Freddie Hubbard to Woody Shaw with pit stops by Kenny Dorham, Blue Mitchell and Charles Tolliver, and a soupcon of Booker Little and Miles Davis. Whether limning a ballad or uncorking a searing bop line, Lynch projects a rich tone that ranges from warm to brilliant, uncoiling serpentine lines that land in the most surprising places. For a great melody felicitously ornamented, turn to Lynch’s presentation of I’ve Grown Accustomed To Her Face. 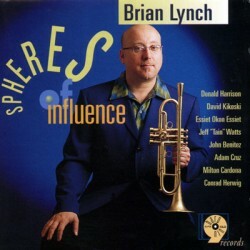 The luminous, richly textured brass arrangement, a celebration of metric modulation, displays a dimension of Lynch’s craft not previously shown on record. Anchored by the deep grooves laid down by Palmieri bandmates bassist John Benitez and drummer Adam Cruz, plus master conguero Milton Cardona, Lynch builds a bold ascendent statement out of long, complex lines, biting off the notes over alternating swing and montuno passages flowing seamlessly one to the other. The bass and drums follow him with soft, timbrally nuanced interlude, resolving ingeniously into some concluding trumpet probes. Clairevoyance, featuring Lynch and Donald Harrison with the Latin rhythm, is a more explicit homage to Horace Silver, who as much as any jazz composer incorporated a clavé feel to his swing. “It wouldn’t be too far-fetched to hear a Horace Silver band playing this tune,” Lynch notes. “It’s got the two-horn sound with strong rhythm underneath. I wrote it with John Benitez in mind a few years back; the bass has the melody and we have the counter-melody. There’s a recurring theme in the intro and in the interludes reminiscent of ‘Ecaroh’ which is a basis for a drum solo at the end, and I’ve seen drummers go crazy on it. The second arrangement for brass, Palmieri’s Mood, an idiomatic tribute to Eddie Palmieri, “was a real effort to evoke the sweep and grandeur of Eddie’s compositions. It emulates the Latin son montuno form. We stretch out the song part to include all the solos, then we go to the montuno with the percussion solo, then I come back in for a little bit more after the brass fanfare -moña, we call those things. Then we come back in and take it home.